Why cluster or develop communities of schools? Here are a few reasons taken from a proposal that will go to AorakiNet and Cantatech Principals soon. Thanks to the VLN community for the contributions. Access to a free online environment that includes an LMS (Moodle), Google Apps for Education and an ePortfolio system (Mahara) for all teachers and learners. Opportunities for teachers to collaborate through the LMS and Google Apps and therefore better cater to the needs of individual students. The following is a very interesting read, if a British perspective on LMS’s, which clearly highlights the challenge facing the use of these sorts of environments. At the moment most LMS’s are mainly used as repositories, rather than open learning evironments. They replicate traditional classroom approaches in secondary schools, but we need them to transform. There is massive potential for them to do this, but it does depend on how they are used. I do believe that some of the proprietary systems around encourage the whole repository idea. They have limited functionality in terms of learning. Back to the main topic though. I love Moodle, but it has it’s limits and does tend to be teacher driven. How do we ensure that this rich environments are used effectively? Wecome to my new blog! My previous blog was a mix of my job and my own personal thoughts. I have decided to separate them into two blogs – this one being my own personal thoughts. This post is at edtechpost really resonated with me. I have really been uncomfortable with the idea of “forming a community” where our staff collaborate and share. To me it needs to be an organic thing. We may create spaces on the Moodle site for sharing and we may organise VC meetings for the learning area, but that doesn’t mean teachers will actually use them. You can’t create communities from the top down. Many teachers have built their own support networks already and they won’t be too intertested in someone dictating one to them. I am in the process of calendaring in meetings for next year, but I have the attitude that they are there if you want to come along, rather than something that is expected of them. The edtechpost post(!?) has given me some ideas about sharing. Rather than create spaces on the Moodle, which will probably largely remain empty, we look at enabling teachers sharing through a wide range of tools. This might include the use of listservs, contact lists, wikis, or various online repositories. There are some excellent, easy to use repositories out there. Just check out these at smashingapps. So what does it actually mean? A colleague of mine, Janet, made a very insightful comment on this – collaboration is more than just sharing. She is exactly right. Collaboration is about building knowledge and skills together. It’s about co-contruction. So how do you get what is quite an isolated profession, teachers, to collaborate? This is the major challenge I face in this job and one I have only tinkered around with this year. That’s mainly because I have spent time focussing on other aspects of the strategic plan and because I want to do it right – otherwise we might not get another opportunity. Teachers can be an unforgiving lot if you waste their time! I didn’t have an opportunity to plan for this year at the end of the previous year, so this is what I think should happen next year. A jumbo day at the start of the year where everyone meets face to face. This is imperative and is something they have done at Volcanics. Any meetings need a purpose so I wanted to build meetings around a programme of professional learning related to the Revised Curriculum. Other groups provide obvious opportunities for needed collaboration. One example is the Specialist Classroom teacher position. Any meetings needed to be calendared at the end of this year – with agreement and buy in from all principals. It is important that meetings don’t become an extra burden. They need to be carefully calendared. Collaboration needs to be a part of every school’s strategic plan. All teachers have the contact details of others in their learning area / specialist area / year level. I originally planned to use the Moodle as a database for this. Enrol all the teachers into learning area spaces and then use the news forum. The problem is that it will take some time before all teachers have a basic knowledge of how to use the Moodle. Listservs might be a good way of doing this. Conor…how has this gone at Volcanics? An online space for the sharing of ideas and resources. This is one of the functions of the Moodle, but as I have already mentioned it will take some time to get all the staff trained in the basics. Mind you, staff were required to upload resources to our Interact site at my previous school and they managed it. That was the key though – they were required to do it. Anyone else got some good ideas on how to facilitate collaboration? Lets face it, teachers are not used to it are they? It would be fair to say I haven’t had a big presence in Rangiora New Life School this year. That’s mainly because they already have their own LMS – MyClasses and an eLearning Co-ordinator of their own. This means they are quite a way ahead of many of the other schools in Cantatech, so they haven’t needed me quite as much. They still have an interest in where the Moodle environment is going though and my visit yesterday proved extremely productive. I had a good discussion with Gregg, their principal who was keen on many of the issues we discussed. These included – Sorting out Cantatech courses for 2009, Collaboration, Gifted and Talented, and eLearning. We have strong numbers for L2 History next year, so it was good to get confirmation that Adrian (their Cantatech teacher) was available to teach that course next year. Adrian is an experienced VC teacher, who has impressed me with his enthusiasm. I didn’t realise he is 62! So it’s good to see someone in the twilight of their career still wanting to trail blaze. One of the major challenges for me in this job is to facilitate collaboration amongst all staff in our cluster. I will post somethig on this soon, so I won’t elaborate here, but needless to say it is no easy task. Like any school, RNLS staff are members of various communties and have established their own networks. I very much doubt they are at the scale we are aiming for, but many teachers feel comfortable with what they have. This is very much the situation at RNLS. Gregg thinks the senior staff are more willing to meet with other staff in Cantatech, than the junior staff. He said that senior management certainly had a vision for online communtities as being one form of professional learning, but we both agree that it needs to be very well planned and have a purpose. He suggested NCEA moderation as an easy hook and one I hadn’t thought of is the Specialist Classroom Teacher (SCT). This position is new to many in the cluster so it would be an obvious one to target for collaboration and networking. So some productive discussion there. The final issue of discussion was on eLearning. We decided (with Hans, their eLearning Co-ordinator) that I could work with Hans on some eLearning workshops run in the school next year. I could offer some hands on stuff with web 2.0 which they haven’t really touched with their staff yet. I have tended to steer clear of hands on PD, because I don’t see it as my role, but I think it has huge benefits in raising your presence in a school. It’s all about balance in the end. How often to tavel? When to VC? When to get hands on? How much time to spend on strategic stuff? Because it is a new role all the ePrincipals have taken slightly different roads, and we have all probably changed our thinking on how to approach things a few times during this year. I know I have anyway. I have embedded Rose’s PPt above, which she kindly gave me permission to do. Have a good look through it as it is very good and is a nice sequel to Rachel Bolstad’s presentation in an earlier post. The main thrust of Rose’s talk centred on how we provide coherence in curriculum design and the implications for how we assess. Much of the focus was on the key competencies which Rose sees as integral to providing the links betwen the front and back end of the curriculum. The back end of the curriculum is nothing more than a condensed version of the pervious curriculum, with AO’s relating to the different learning areas. It is the part of the curriculum that most teachers are familiar with. The front end is a totally different beast and it is here that we see the possiblity for transforming schools (especially secondary). Rose suggested that the key competencies “might be the glue” that ties these two together. One of Rose’s major questions was one that many educators are asking – Should we assess the key competencies? In short the answer was no, but the outcomes of these comptencies might be assessed. I am in toal agreement with this – it makes little sense to try and assess the competencies themselves. Many will probably want to, but we already have too much of a focus on assessment without adding to it further. And it would be extremely difficult to asses them anyway. How do you quantifiably assess “participation” for example? Earlier in the presentation Rose talked about how a holistic approach was need to curriculum design and that a coherent curriculum was vital. I was interested in her ideas about how this coherence might be achieved (check slide 7). At the top of the list of possibilities was ICT and how ICTs could be used to foreground an aspect of learning and/or knowledge construction, not just for information retrieval. Another that I had already considered was the use of future focussed themes, such as citizenship or sustainability. 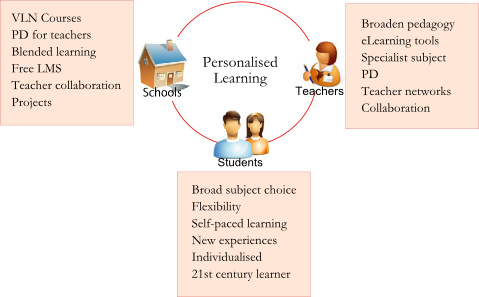 To me if you are going to build a coherent curriculum then you need to pull the learning areas together. You need to contextualise learning for the students and build this context across subjects. I am a big fan of thematic learning and I hope that more secondary schools start looking it as a way of building a relevant curriculum. Slide 17 was an interesting one for me. It was a snapshot of the results of the NZCER’s recent engagement survey. An article featured in the Press recently commented on the same thing. What it shows is that the majority of year 9 and 10s admit to often being bored in class. This is a worrying statistic, though it doesn’t surprise me in the least. This is one of the big reasons schools need to change. If a student isn’t engaged they will find it difficult to learn. And engagement doesn’t mean they have to be entertained. Engagement is about being sucked into learning, it’s about relevance and its also about challenge. Schools need to develop a curriculum which is relevant to students and to what learning means in the 21st century – not sitting them down in rows, facing the front, and ramming content down their throats. Fortuntately many schools have already begun making this change. Now where does assessment and NCEA sit with all this? Well first, we need to start including students in the assessment process far more. Get them assessing themselves and each other. In fact, if a student is going to become self-managing they need to be able to evaluate their own progress. I know many teachers and schools use self assessment in their programmes, but how much of it is actually meaningful? Is it a quick check-list or it a tied into their learning on an ongoing basis? Secondly, despite much of the media and some teachers views, NCEA is not the root of all evil in secondary schools today. In fact NCEA provides enormous flexibity in assessment. Teachers are no longer tied by traditional programmes, and can provide flexible pathways for students. Unfortunately many schools haven’t grasped this opportunity, but the NZC means that it will be difficult for schools to avoid it. NCEA shouldn’t be about rigidity, it should be about flexibiltiy. Sure, many of the standards will need to change, but that is all part of the alignment process which is going on at the moment.